Debris litters Tyndall Air Force Base following Hurricane Michael on October 17, 2018, in Panama City, Florida. the base experienced extensive damage from the storm. Hurricane Michael slammed into the Florida Panhandle on October 10, as a category 4 storm causing massive damage and claiming nearly 30 lives. Officials at the Florida Panhandle Air Force base continue to assess the damage. 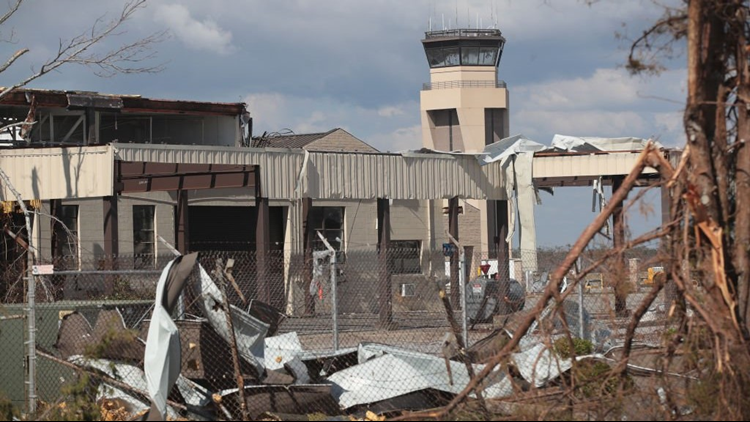 PANAMA CITY, Fla. — Buildings on a Florida air base were damaged by an apparent tornado, according to base officials. Late Sunday, the National Weather Service confirmed an EF-1 tornado with 90 mph struck the base. The air base located in Florida's Panhandle was hammered by Hurricane Michael when the storm ripped through the area in October.